Abstract: The ECS NF650iSLIT-A motherboard supports every Socket 775 processor on a 533/800/1066 MHZ FSB, from the Celeron D to the Pentium 4/D/XE series, and of course the Core 2 Duo/Quad processors. The latest motherboards to hit the streets are future ready; from 1333 MHz FSB to Penryn support it's all there. If you're into performance or games but don't want to break the bank, nVIDIA's nForce 650i SLI chipset is for you. It packs in value and won't cost nearly as much as a high end nForce 680i board does. ECS knows value, that's why its NF650iSLIT-A motherboard is such an attractive mainboard solution for builders on a budget. The nVidia 650i chipset has the features, and the ECS package here is darn cheap! A winning combination if ever there was one. 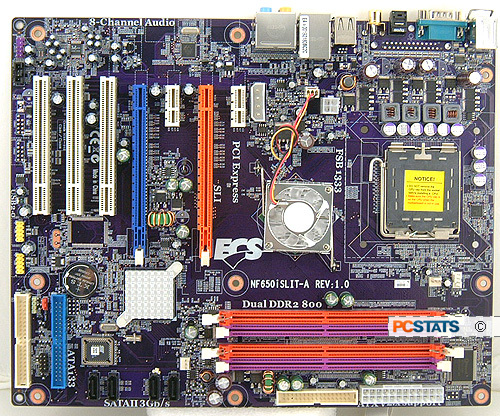 The ECS NF650iSLIT-A motherboard supports every Socket 775 processor on a 533/800/1066 MHZ FSB, from the Celeron D to the Pentium 4/D/XE series, and of course the Core 2 Duo/Quad processors. It will also do 133MHz FSB through overclocking, so that potentially brings the Intel Penryn core into the fold as well. Onboard goodies include dual PCI Express slots for SLI, a Gigabit network connection, 7.1 channel High Definition audio, four Serial ATA II ports, two IDE channels and the usual collection of USB jacks. The ECS NF650iSLIT-A is built with the nVidia nForce 650i Northbridge (C55) and nForce 430 (MCP51) Southbridge. In terms of expansion there are two PCI Express x16 slots (operating in x8 and x8 when SLI is enabled), two PCI Express x1 slots and three 32 bit PCI slots. The most enticing aspect of the ECS NF650iSLIT-A motherboard is its price, just $122 CDN ($116 USD, £58 GBP) ! This board is in the price range of any Intel user. The ECS NF650iSLIT-A motherboard is rather plain, but that's what you expect for the price. It's a full size ATX motherboard, and the overall layout of the board components is good. Everything is in just the "right" spot. Installation is pretty straightforward, the User's Manual and Quick Installation Guide each contain a good set of information. The board supports up to 8GB of DDR2-800 RAM. At the edge of the PCB you'll find the four Serial ATA II slots and at the bottom of the motherboard are the two parallel IDE channels. Nestled between the IDE slots is the front panel I/O header. About the only thing I have to complain about with the ECS NF650iSLIT-A are the PCI Express x16 videocard locks. Those little tabs are almost impossible to reach (even more difficult if you're using a card with a dual slot cooler) and even if you get to it, it requires a lot of pressure to unlock the videocard... It really would have been better if ECS use nothing than what it currently employs. When it comes to SLI'ing two PCI Express videocards together, the ECS NF650iSLIT-A motherboard offers 8 lanes of PCI Express to each videocard. This is less than the full 16 lanes a PCI Express videocard really craves, but most current generation videocards run without any significant handicap. If just one videocard is installed, that card gets the full 16 lanes of PCI Express. 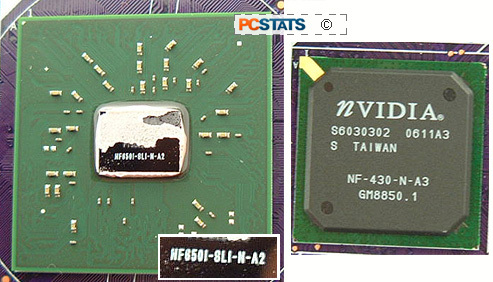 Feature wise the nVIDIA nForce 650i SLI offers only a small improvement over the nForce 570 SLI Intel Edition chipset. In fact the only new feature it incorporates is support for a higher FSB, 1333 MHz. Unofficially the nForce 650i SLI chipset is also supposed to be an overclocking monster... for the final word on that flip on over to the next page of this review. Between the nForce 650i SPP and nForce 650i MCP is a 2GHz HyperTransport connection. The nForce 650i SLI Northbridge supports the regular JEDEC standard DDR2-800 memory. We should also note that the nForce 650i SPP supports 16 PCI Express lanes itself. The nVIDIA nForce 650i MCP Southbridge is the busier of the two, with capabilities to support two PCI Express x1 lanes, five regular 32 bit PCI slots, one Gigabit MAC, a 7.1 channel High Definition Intel Azalia audio controller, four Serial ATA II slots and two IDE channel which supports four devices. NT face=verdana size=2>Of course, it is up to the individual motherboard maker to decide how and which of these features are actually implemented. nVIDIA's integrated audio solution supports Intel's High Definition Audio Azalia standard. On the hard drive front, nVIDIA's Serial ATA II channels adhere to the Serial ATA 2.0 spec and support RAID mode 0, 1, 0+1 and 5.
nVIDIA's nForce 650i SLI supports nTune which is arguably the best enthusiast software available. It allows users to control their systems and realistically with nTune, there is no longer a need to go into the BIOS to adjust settings, now you can do everything within WindowsXP or Vista!